Sir Samuel Scott, Bart, until after 1860. On the banks of a broad river, a milkmaid sits at her work. 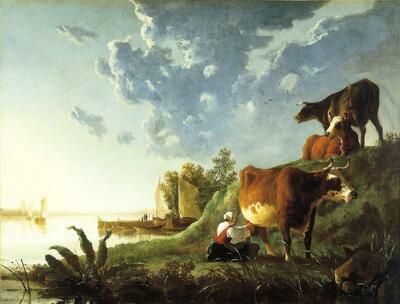 Atop the lush embankment, her cows gaze out over the still water, where sailboats drift in the early evening haze. Two other boats, their sails still unfurled, have pulled up to a nearby jetty. The setting sun bathes landscape and sky in a radiant light, that streams towards us from the distant horizon. Aelbert Cuyp was one of the most important landscape painters of 17th-century Holland, renowned for blending typically Dutch subjects with lighting effects borrowed from Italy. Here, he captures the mood of a warm, windless evening. Jis representation of depth is particularly effective, as our eyes are drawn, for example, from the large cow in the foreground to the jetty beyond and on to the windmill on the horizon. His sense of tone and scale, and his use of golden atmospheric light, transforms this rustic scene into one of ideal grandeur. Evening in the Meadows draws on symbols instantly familiar to contemporary viewers. The large milk cow refers to the fertility of the land—specifically, the productivity of the local economy. Painted soon after Holland’s long war with Spain, the canvas may also carry political implications, celebrating the arrival of a Golden Age of peace and prosperity. To hear contemporary remarks on the bounty of the Dutch countryside, press 1571.